Although it is around 30 years since singer/keyboard player Gwen Avery left her home town in Verona, PA for the West Coast, "Sugar Mama" is her first album. Produced by the Grammy-nominated Linda Tillery, the album features some noted musicians from the Bay Area including bassist Ruth Davies (ex Charles Brown) on several tracks. Avery herself sings and plays electric piano on most of the tracks, and wrote six of the 12 songs. The millennium version of Avery's signature tune ("Sugar Mama Y2K") opens proceedings. Things start off in a laid back late night lounge style, and meander along for a while before getting transformed into a much tighter, punchier affair that makes you sit up and take note. The opener is followed in rapid succession by covers of "The Thrill Is Gone" and "Georgia On My Mind." Both nice enough in their own right, without ever reaching the heights of the versions by BB King and Ray Charles respectively. Then it's back to another of Avery's songs ("Marianne") which is driven along by a calypso beat complete with (synthesized) steel drums. There is a definite gospel tinge to much of Avery's vocal intonations, often blended with the sophisticated soul stylings of an Anita Baker, especially on "Sad Song" (not the Otis one!). There is also a cabaret element to Avery's sound, which is most evident on Nina Simone's "Sugar In My Bowl." The album's bluesiest track is probably the penultimate "Do I Move You," which is the second tune written by Nina Simone. It features some very nifty guitar work from Roderick Munson and Shelley Doty. Then, by way of contrast, Avery reaches into the gospel songbook of Tommy Dorsey for the closing rendition of "Precious Lord, Take My Hand" which opens with some appropriately churchy organ from John R. Burr, before the band rock things up a bit. 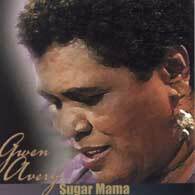 Overall "Sugar Mama" is a good album, which shows that Avery is an accomplished singer and songwriter. The style veers more towards the smooth and sophisticated end of the blues, blending together elements of gospel, soul, and blues in varying quantities. You can purchase Gwen Avery's "Sugar Mama" by venturing to her web site (www.gwenavery.com). This review is copyright © 2001 by Gordon Baxter, and Blues On Stage, all rights reserved. Copy, duplication or download prohibited without written permission. For permission to use this review please send an E-mail to Ray Stiles.